If you enjoy sliding down poles to get into your man-cave, exposing your furry chest in a crammed phone booth, or tying up bad boys with your magic lasso, we've got the perfect weekend for you! 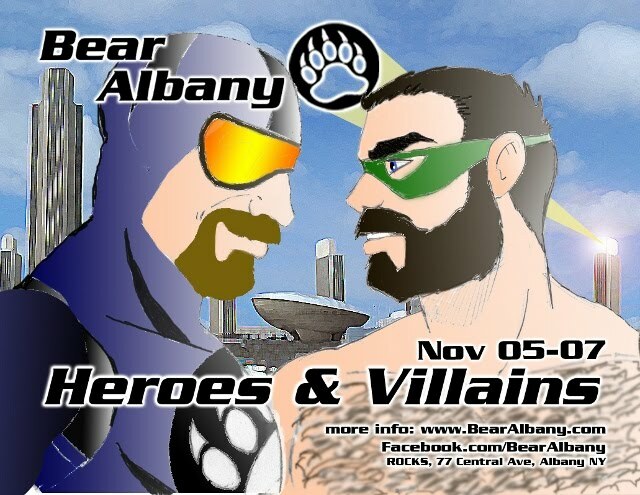 The Bear-Signal is flashing brightly in the Albany skyline and we need your help putting a stop to all the chaos and mayhem before it happens. Or maybe your the type who prefers to instigate a little pandemonium and anarchy in the streets, turning the lives of your arch-nemesis or the Bear Community utterly upside-down. Whichever the case, it's time to break out your secret identity, dust off your mask & combat-gloves, and fly your invisible jet to Bear Albany's HEROES & VILLAINS weekend!